Priscilla Burris is an illustrator and designer of many books for children. Preschoolers will delight in this fun, repetitious rhyme with adorable frog characters. Watch as one by one, they hop off their speckled log to one very cool ending! 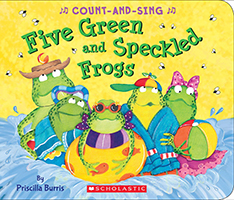 Priscilla Burris's distinctive frog characters put a new spin on a favorite preschool song.